We're currently deep into the summer movie season, and while there have already been big hits like Guardians of the Galaxy 2 and Wonder Woman, the most talked-about movie of the summer may be coming from the Netflix streaming service. 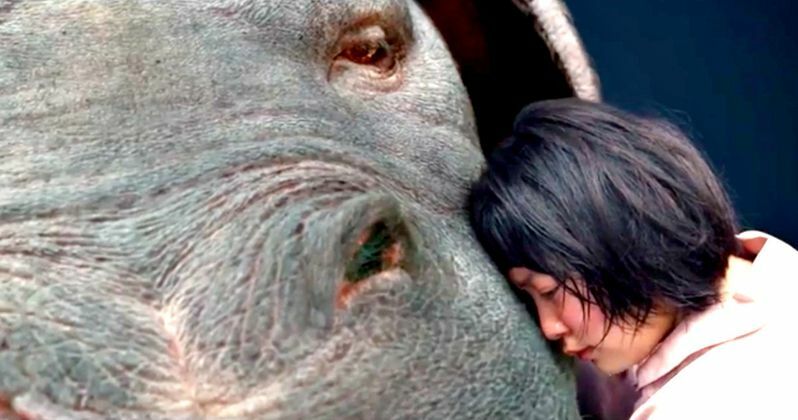 Netflix has released a third trailer for Okja, which is set to debut Wednesday, June 28, the same day as another highly-anticipated movie hits theaters, Edgar Wright's Baby Driver. While the reviews from the Okja world premiere at the Cannes Film Festival have been strong, it also caused quite a bit of controversy. We reported last month that the Okja Cannes premiere lead to many moviegoers booing when the Netflix logo was shown on the big screen, and that the premiere was marred by a glitch that caused the film to be started over, with the Netflix logo booed even more the second time around. The festival denied claims that the glitch was some sort of an anti-Netflix sabotage, although both Okja and another Netflix movie that debuted at the festival, The Meyerowitz Stories, were protested for being in competition for the prestigious Palme D'Or, since neither movie will be released in theaters. This protest lead to the festival enacting a new rule starting next year, which bans streaming-only films from the festival. Regardless of the controversy, the movie has quite a bit of buzz swirling around it, as we get closer and closer to the June 28 release date, due to the overwhelmingly positive critical reception. This new trailer from Netflix showcases several glowing quotes from critics around the world, who have nothing but high praise for director Bong Joon-ho's new film. While the trailer largely centers on the title creature and Mija, played by newcomer An Seo Hyun, we also get a brief look at Lucy Mirando, played by Tilda Swinton, the CEO of a multinational conglomerate that steals Okja from her home in the mountains of South Korea, to New York City, where Lucy has big plans in store for this unique creature. While Mija goes after Okja with the intent of bringing home the friend she has cared for over the past 10 years, she meets a number of disparate groups along the way, comprised of capitalists, demonstrators and consumers, each battling to control the fate of Okja. The trailer also gives us a new look at Paul Dano's character Jay, who reveals to an unseen character that everything they think they know about Okja is a lie. We also get a brief glimpse at Red, the character played by Lily Collins, who is seen lighting the fuse of some sort of explosive device, before walking out of an abandoned building. Also appearing in the movie are Steven Yeun, Devon Bostick, Giancarlo Esposito and Jake Gyllenhaal. With less than two weeks left until Okja debuts, it remains to be seen how much more footage will be shown. Regardless, director Bong Joon-ho's Okja is riding a wave of critical buzz that could lead it to being one of this summer's most talked about movies. Take a look at the latest footage, as we get ready for the June 28 release.